Ron will be directing Coming Home for Erasing the Distance this August 2015 for a short run. This is a first person documentary style theatre piece exploring homelessness and mental health issues in the African-American community. Ron will be appearing in Billy Elliot The Musical as "Dad" at the Drury Lane Theatre. Directed by the award winning Rachel Rockwell and based on the internationally-acclaimed film, the smash hit musical Billy Elliot follows a young boy as he trades in his boxing gloves for dancing shoes. In a small town in the English countryside, Billy discovers a passion for dance that inspires his family and his whole community, and changes his life forever. Purchase tickets here. Playing through June 7th, 2015. The independent feature film We Grew Up Here featuring Ron and starring members of the indie rock band Paper Thick Walls is now online and available to rent or own. Click here to watch the film: https://www.yekra.com/we-grew-up-here. Ron sang the National Anthem for the Chicago Bears v. Detroit Lions game, December 21, 2014 at Chicago's Soldier Field. Watch it here. 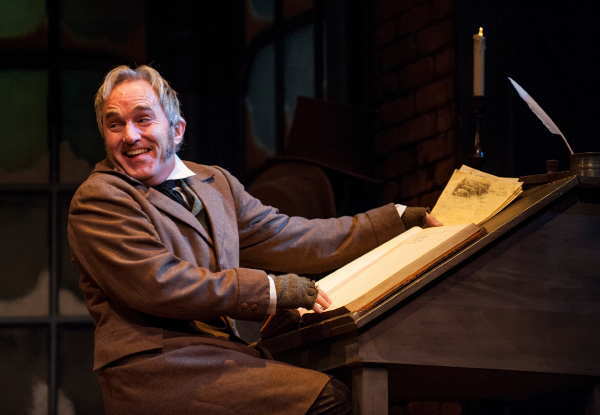 Ron returned to the Goodman Theatre stage to reprise the role of Bob Cratchit for his 8th consecutive year. Performances continued through December 28th, 2014. Ron will be performing live in Chicago's Thanksgiving Day Parade with cast members from Goodman Theatre's 'A Christmas Carol'. I'll be doing a reading of Bram Stoker's spooky one-act 'The Judge's House' at Chief O'Neill's Pub this Sunday October 20, 2014 at 2 & 4. Ron wrapped an industrial film for Microsoft's Human Resources Department, in the role of a disgruntled employee. Thanks to Joel Umbaugh and the crew of Zoocreate for the great time on set! WORSEBEHAVIOUR is the story of a man's hopeless infatuation with a woman at a local cafe and how it leads to them both being abducted by a violent, mentally unstable man. Part thriller, part romantic comedy, part dark comedy, part horror film. Ron will play the role of the violent, mentally unstable man. Fresh off of serving a 20-year stint in prison, a former Golden Gloves winner investigates the murder of his son by the hands of Chicago Police. Ron will play the role of ex-cop and restaurateur Lenny Bruce (not to be confused with the late comedian of the same name). Read the casting announcement press release here. This will be Ron's 8th year in the role of Bob Cratchit.